Supporting children’s language development is an essential goal shared by preschool teachers around the world. This is the first article in a series about asking questions that foster rich conversations. 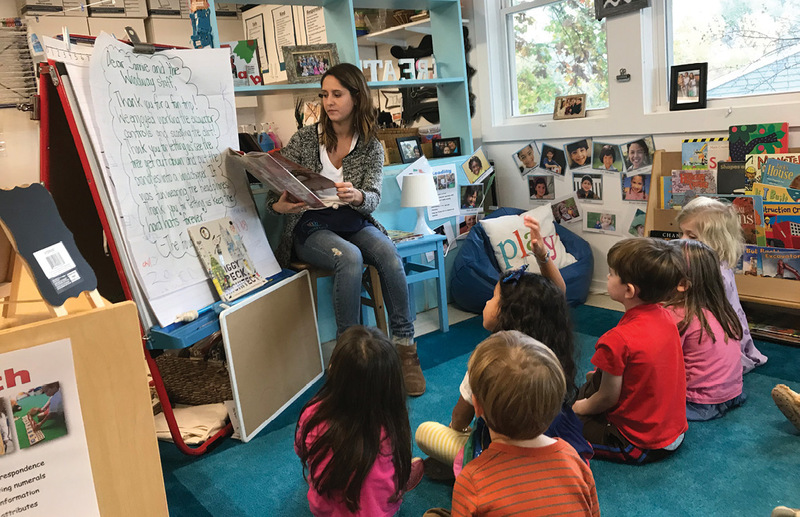 Visiting a variety of preschool settings, we’ll consider the different types of questions teachers ask and listen to children’s responses. Drawing on an adaptation of Bloom’s Taxonomy, teachers in this series demonstrate the many opportunities there are to ask children a variety of questions that lead to meaningful discussions and deeper relationships between children and teachers. (See “Understanding Different Types of Questions.”) Through these examples, we hope teachers will reflect on how their own questions tune in to children’s thinking. Let’s look first at a small cooperative preschool I visited in suburban Connecticut. Observing adults and children in the classrooms, I was struck by the way the children’s work—drawings, dictations, artwork, and more—was displayed around the room. Their work offered countless conversation starters. 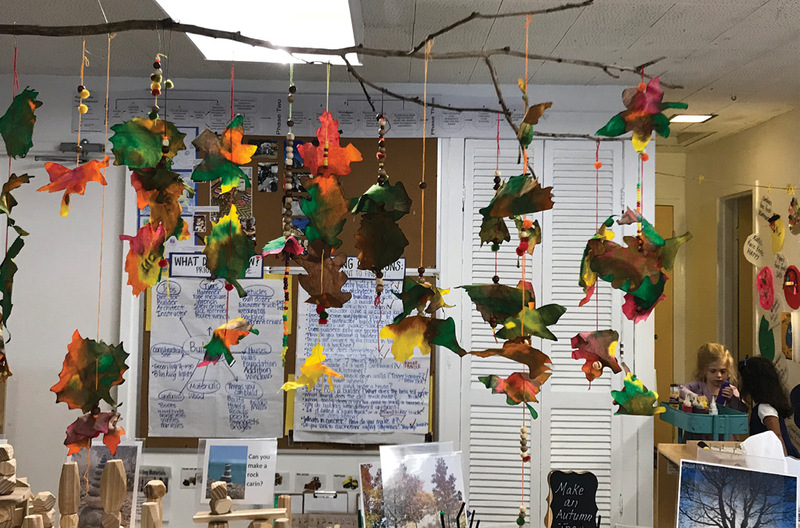 Teachers asked questions about the thematic unit (construction) and the class’s seasonal activities (making fall leaves), which were intended to help children develop concept knowledge and vocabulary. The children eagerly shared the interesting things they were learning in the classroom and on field trips. Bloom’s Taxonomy has long been used to generate questions. Here, we have an adapted version designed to support preschool teachers. The point is not to move up the steps, but to ask a variety of questions and spark meaningful conversations. When children are asked questions, they must use one, some, or all of the categories below to come up with an answer. The more complex the question, the richer children’s language and thinking. While it’s vital to encourage children to engage in more complex thinking, all questions have value. Remembering information is the foundation children need to answer more complex questions, such as “How will you figure out the number of plates we need on the table for lunch?” Or before children can create new characters and make up a new ending to a story, they need to first remember that there are three little pigs and a big bad wolf and understand that the pigs have to figure out how to build stronger houses. As you reflect on the questions you ask, also think about each of the children you work with. Use these question categories to guide you as you select different types of questions to scaffold individual children’s thinking and learning. 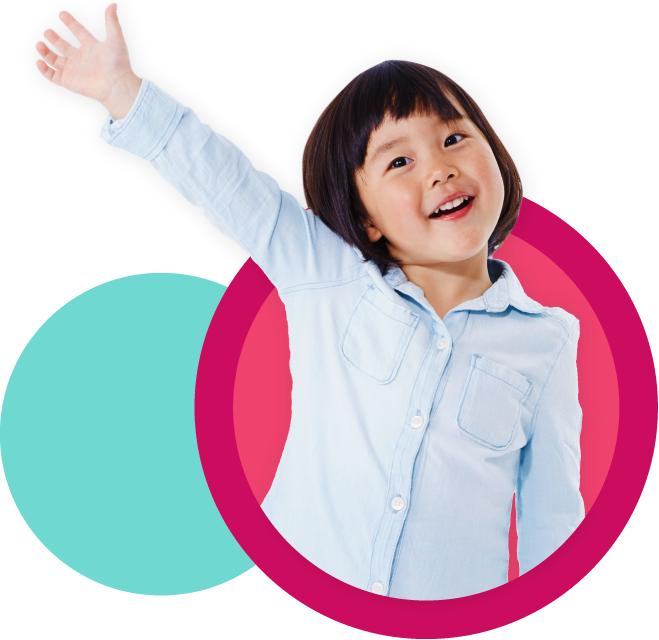 When working with children who do not yet have much expressive language or experience answering complex questions—or with children who are dual language learners—it is especially important to ask a range of questions (starting with questions that require less language). Talk with children about their activities. By listening to children and tuning in to their responses to different types of questions, teachers can scaffold children’s learning. Questions can lead children to think about and express more complex ideas. 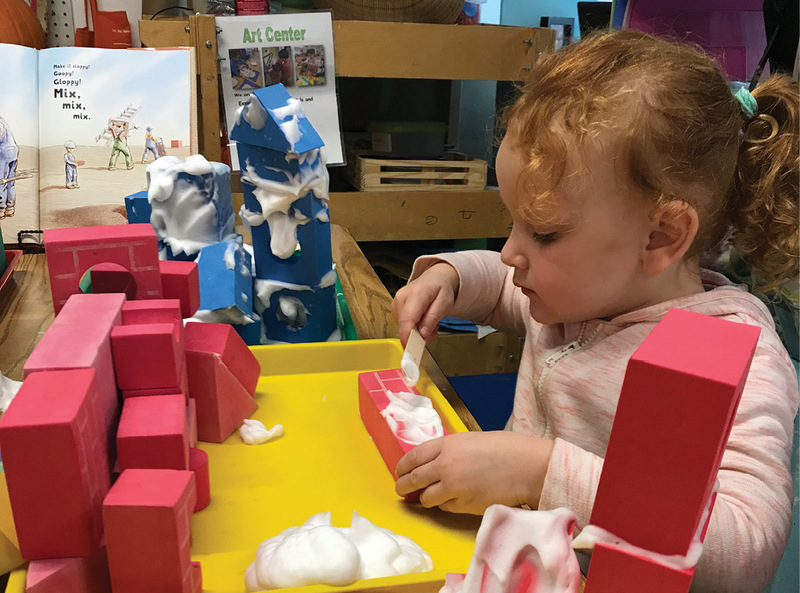 In the art center, children were building structures with foam blocks. They used shaving cream to “cement” the blocks together. On field trips to construction sites, they were introduced to the word mortar after seeing mortar being used to lay bricks. Child: A house, where the chimney is. . . . The bedrooms are upstairs. The people start here [indicates stairs inside the front door], . . . go up, . . . playrooms, bedrooms. Children made drawings on their field trips, which were displayed on the bulletin board. Many of their illustrations included construction vehicles. Child: Different ones pull each thing, and then they do what they do. For a whole-group read-aloud, Megan, the student teacher, was reading Billions of Bricks: A Counting Book about Building, by Kurt Cyrus. Child: They’re making a house! Megan: What do you notice? (Understand) Maybe we should bring the book on our trip and ask some of these questions. Child: The stuff being poured is concrete. Child: They’re gonna make cement. Teachers referred to the physical environment to engage the children in conversations. The children were excited to talk about topics that are important to them, including things they made. It is important to ask children open-ended questions, listen to their responses, and then talk about what interests them. Individual mobiles—constructed using beads, pom-poms, and paper leaves—were hung in the classroom. The leaves were painted with watercolors in fall colors. The mobiles were all strung from one big tree branch suspended overhead. Child: We used needles and leaves. We put watercolor on with those little droplet things. More children joined in, expanding the conversation. They described differences between the paper leaves and real ones and compared the red leaves with the green ones. Photographs of children’s families were displayed around the room. Child [pointing to two framed photos of families in the dramatic play area]: We bringed in the pictures. The child mentioned that the people were different, they were playing in one of the photos, and there were differences in the frames. To make cakes, two children were digging in the sand and spooning it into cake pans. Child: Vanilla with blueberries and sprinkles. Child: We’re making names on it. The class talked about what letters their names start with and how they spell their names. Asking meaningful questions that are interesting to each child takes a lot of practice! In the next article, we will listen to teachers’ questions and children’s responses in Atlanta, Georgia. Note: Thank you, Dana (director and teacher), and our thanks to the other teachers; to Megan, the student teacher; to the parent volunteers; and most of all, to the children of Community Cooperative Nursery School for giving us a glimpse into your program! 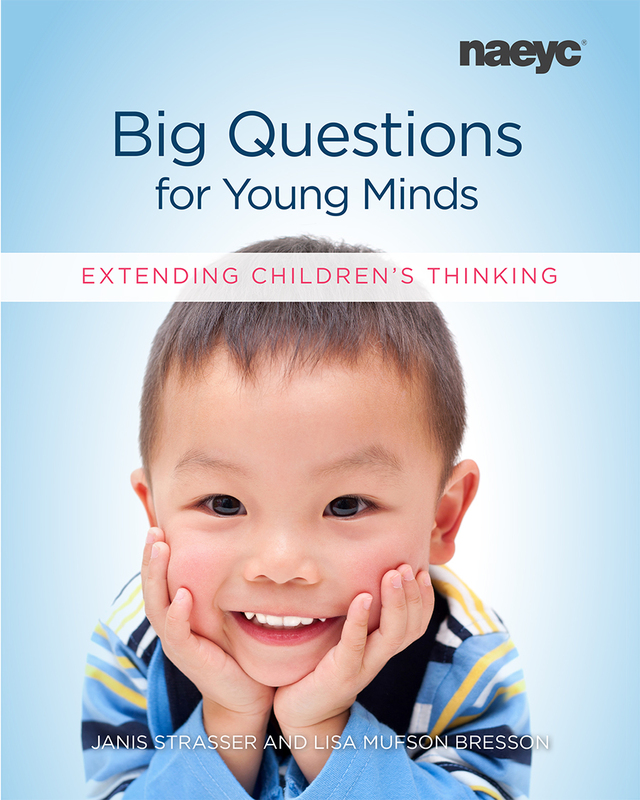 Some text in this article is excerpted from Big Questions For Young Minds: Extending Children’s Thinking. Janis Strasser, EdD, is a teacher educator and coordinator of the MEd in Curriculum and Learning Early Childhood concentration at William Paterson University in Wayne, New Jersey. She has worked in the field of early childhood for more than 40 years.